Onpage Hero extends Google Analytics functionality with unique custom dimensions. 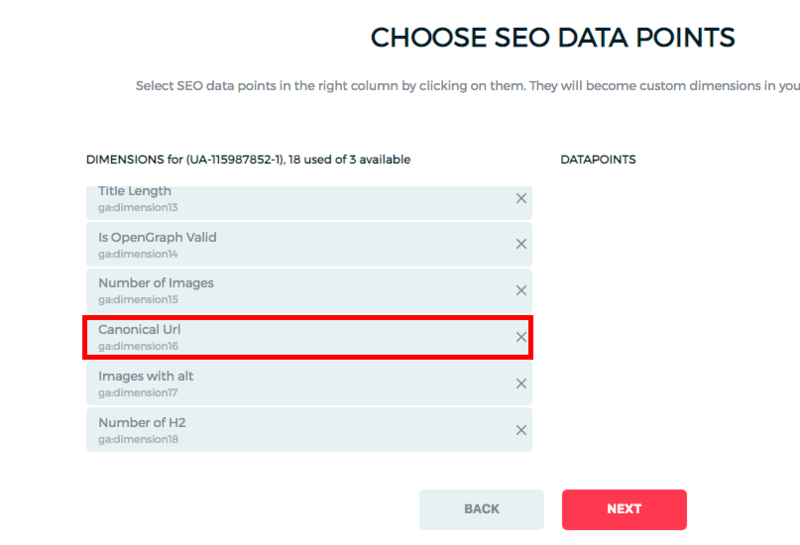 This time we are focussing on automatically detecting the canonical URL of each page using the Canonical URL Onpage Hero custom dimension. Firstly, make sure you have the Canonical UR dimension selected as part of your Onpage Hero plan. Free plans allow you to add up to 3 datapoints, whereas paid plans allow up to 20. The options on the left show the datapoints applied to this property. 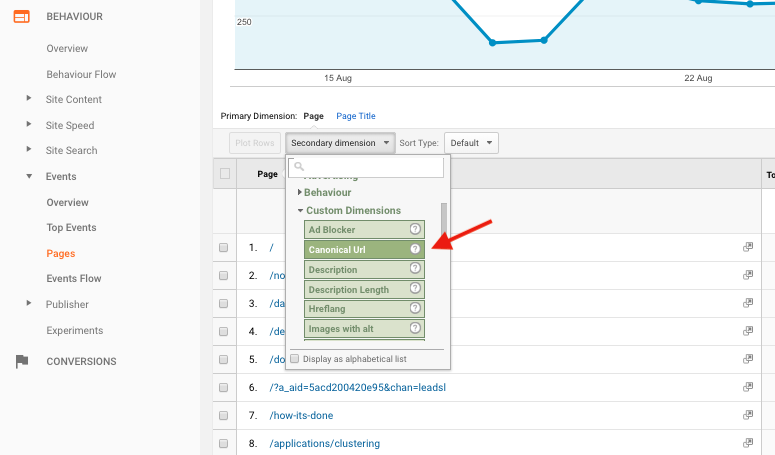 Select the Canonical URL dimension, click NEXT, then VIEW ANALYTICS to jump into your Google Analytics property. The rel=”canonical” is a HTML element that specifies the preferred version of a page. This helps webmasters avoid duplicate content issues. Rel=”canonical” tags or canonical URLs are used when very similar content is linked from different sites to ensure search engines know which piece of content to index. Why are canonical URLs important? Setting canonical URLs ensures that search engines crawl your site correctly. Without these definitive versions of pages, you may get hit with a duplicate penalty. CMS platforms allow URL parameters such as example.com/blog/?facebookcampain which causes different URLs to show the exact same content. Canonical URLs always point to the cleanest version of a page and ensure your site is indexed correctly. To find the Canonical URLs custom dimension in Onpage Hero, simply navigate to your default view within in your Google Analytics property. Ok, let’s see our data. First, type “canonical URL” as a secondary dimension to display the results. The results display each canonical URL page-by-page. This custom dimension allows you to quickly spot missing or incorrect canonical URLs. Canonical URLs are just one of the meta tags that Onpage Hero allows you to see in Google Analytics. Others include the robots meta tag and hreflang tag. To see these three meta tags all together head over to our dashboards page and grab the Meta Tags custom report for Google Data Studio. Simply select the property you wish to see the data for from the drop-down menu.